Looking for a great weeknight dinner idea? 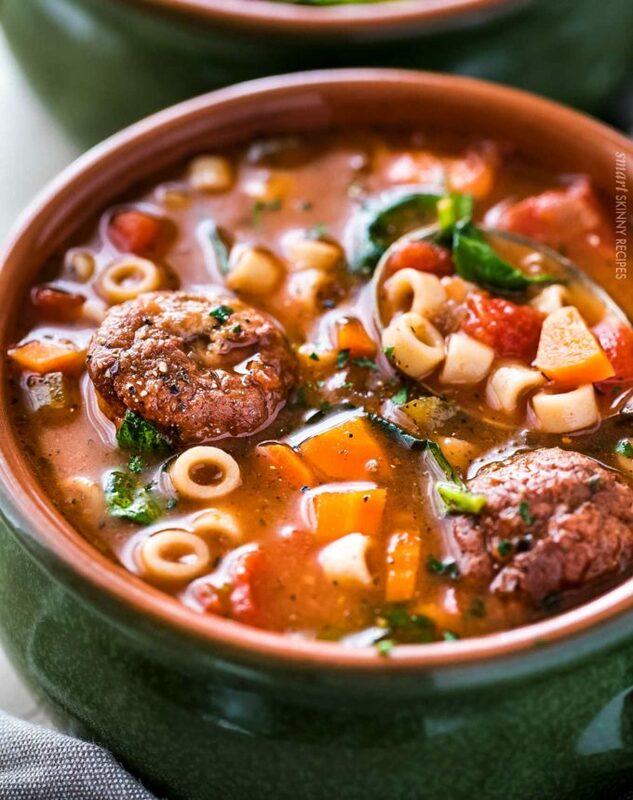 Give this Italian meatball soup a try! Full of vegetables, hearty meatballs and pasta, you’d never know it was only 4 smart points. Much to my dismay, we still have a several weeks (or more) of summer and humidity left. Ugh. 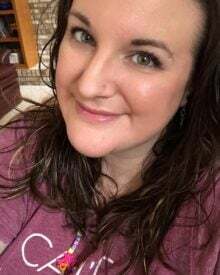 I know, I’m SO ready for Fall! I’m a huge soup lover, and am so ready for all things comforting. We eat soup year round, but there’s just something extra comforting and delicious about soup in the Fall! 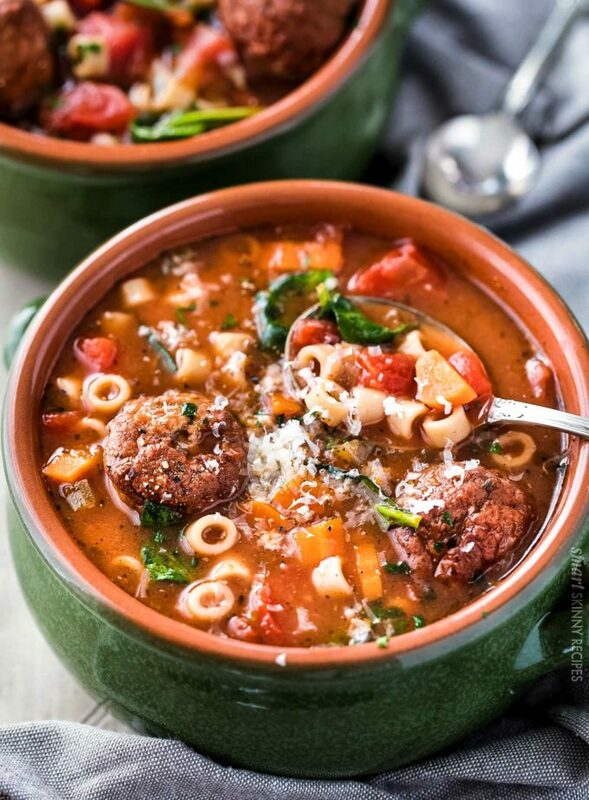 Especially a soup like this hearty Italian meatball soup! It’s light, but not light-tasting… which is the best kind of soup isn’t it? 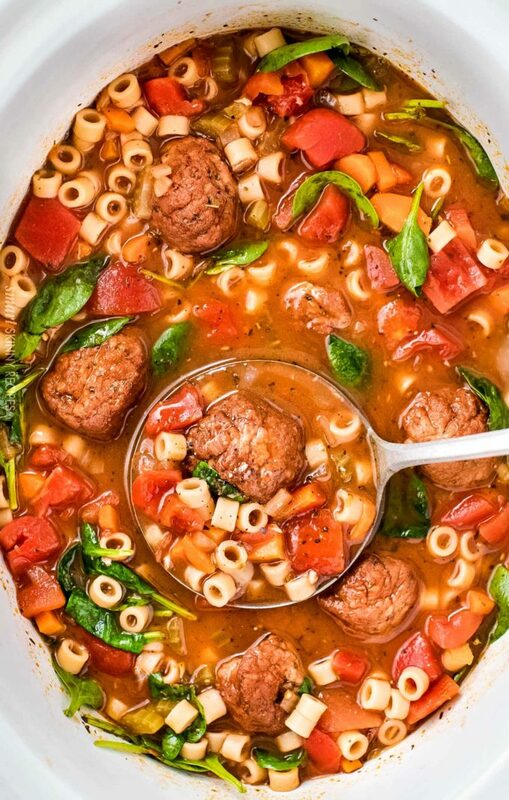 Another great thing about this Italian meatball soup is that there’s nothing to pre-cook or brown… it all goes right in the slow cooker! HOW LONG DOES IT TAKE TO COOK MEATBALLS IN SOUP? Normally, with freshly made meatballs, on the stovetop, they’d have to simmer for at least 20 minutes. But in this soup, I’ve made it incredibly easy by using frozen fully cooked meatballs. No messy meatball hands, and no guessing if the meatballs are cooked all the way through! I know you may be wondering why on earth you’d want to INCREASE the points in a meal… and I know it seems a little counterintuitive. But eating only 0-2/3 point foods will likely not keep you satisfied, and can lead to some unhealthy snacking, which totally undoes all the good you’ve been doing! So sometimes adding a few extra points here and there (while still staying within your daily/weekly allowance) actually helps you stick to your healthy way of eating. 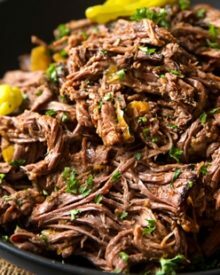 6 quart slow cooker – This is a recent addition to my slow cooker collection, but it cooks wonderfully and the lid locks in place! 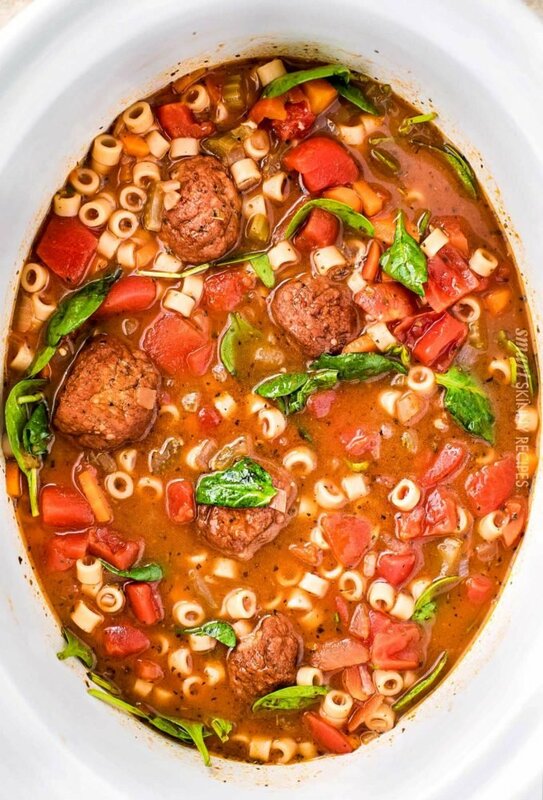 This hearty and rich Italian meatball soup is made easily in the slow cooker. To a 6 quart or larger slow cooker, add carrots, celery, onion, Italian seasoning, black pepper, bay leaf, meatballs, broth, water, wine, and canned tomatoes. Stir to combine, cover and cook on LOW for 6-7 hours, until vegetables are tender and flavors are combined. Stir in ditalini pasta, cover and cook on HIGH for 15 minutes, until pasta is tender. Remove bay leaf and stir in spinach until wilted. Serve hot, with freshly grated Parmesan cheese if desired (this is not included in the point value). 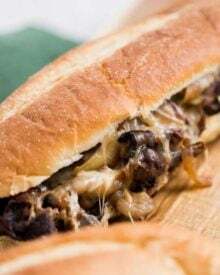 This was so easy and so delicious but of course my slow cooker wasn’t quite big enough. But, still great. My family and I love this soup. I’ve made it over and over and closely follow the recipe. Perfect. Recently served it with warm sourdough bread. So, so good. Amazing recipe! The red wine is essential for this recipe (in my opinion). It gives the broth such a beautiful depth and richness. I didn’t have spinach but it was ok and the crockpot wasn’t big enough so I used a le creuset dutch over and cooked till veggies were soft. I didn’t have Italian seasoning so I used the ones I have and made my own. Rosemary is so great with this soup! Thank you for sharing the recipe! Hi, I Got all but how much is a serving???? One cup ?? Approximately 1 – 1 1/3 cups. This was so yummy! 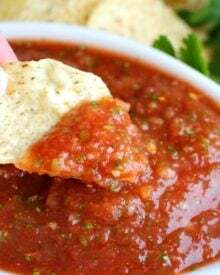 Since we like spicy, I added one can rotel tomatoes and 3 cloves crushed garlic! I will definitely make this again! We’ve made a very similar soup for years and the whole family loves it. My brother even requests it for his birthday! This soup is very forgiving and can be changed up in a variety of ways to suit what you have on hand. I’ve used frozen meatballs at times, but I cut them in half because I like them bite sized. I’ve also made my own tiny meatballs and baked and frozen them so I could have them ready when I wanted a quick bowl. If you don’t like diced tomatoes, use crushed. Gives a different texture, but sometimes that May hit the spot. Change up or leave out some veggies. For a heartier meal I decrease the pasta or use just a small amount of rice, but then drizzle a beaten egg into the simmering soup at the very end. Cooks instantly. This recipe also cooks quickly on the stovetop if you use already cooked meatballs. Do I need to make any adjustments if I make my own meatballs and they don’t go in frozen. Too much “junk” in store-bought frozen ones. 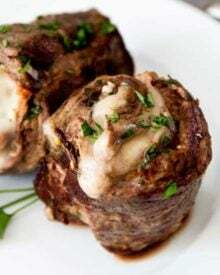 I’ve only tested the recipe as written, so I can’t say for certain, but I would probably brown the meatballs first so they don’t fall apart, and you’ll only need to add them the last 15-20 minutes or so. Made this soup over the weekend! Delicious! Thanks for sharing. This one will become a part of our fall and winter soup rotation. I made this for supper tonight, not in the crock pot, just simmering on the stove. It is so good! My husband and 15-year-old son loved it. I put it on our rotating dinner list. 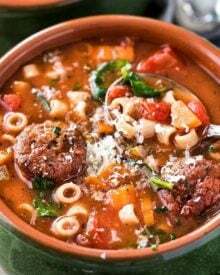 My husband and kids loved this soup! I used the slow cook function on my instant pot and omitted the fresh spinach which I didn’t have on hand, otherwise made it according to the recipe. We all had seconds and there’s enough soup leftover for tomorrow’s dinner. Everyone agreed I should make it again! I will. Thank you! Can I use red wine vinegar as a substitute for red wine? I think that might throw the flavor off… I would just swap the red wine out for an equal amount of beef broth or stock. Can this be made without the wine? I can’t have wine, as it gives me bad headaches. Yes, just swap out the wine for an equal amount of beef stock. I haven’t tested it, but I think it should freeze well. Can I cook on high and reduce time ? I don’t have a slow cooker. 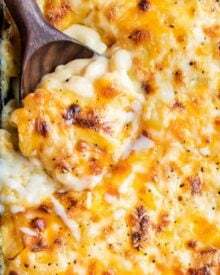 If I want to make this on my gas stove, how long would it need to simmer? Thank you. I would simmer it for about 30 minutes, just make sure the meatballs are heated through. This soup was AMAZING! Thank you! I haven’t precisely measured it, but approximately a cup. 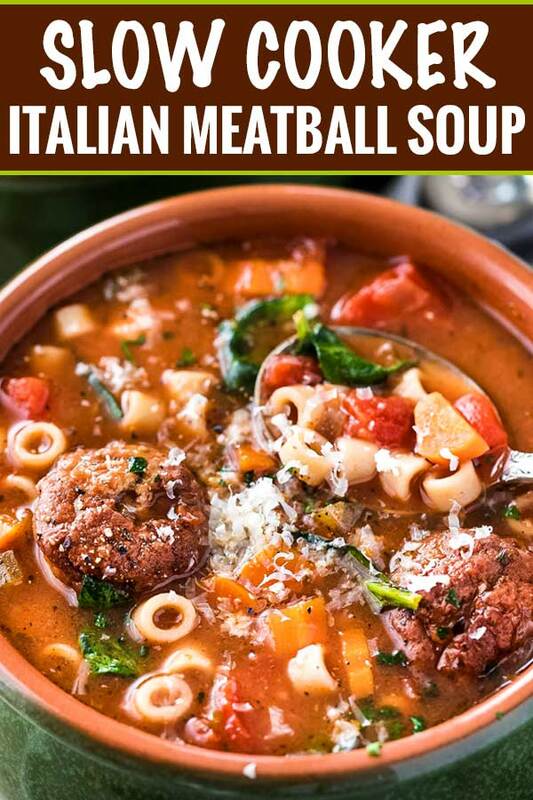 What is the serving size for the meatball soup? It’s sooo good but I need help figuring out the serving size please. Thank you! Hi Angela 🙂 I’ve never measured it precisely, but I think around a cup would be the serving size. 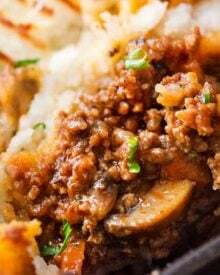 What a delicious hearty recipe for fall! YUM! Wow! This looks and sounds so good! I have to make it when the weather cools off! 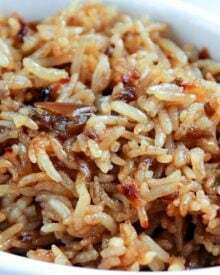 Ive made this recipe for over 20 yrs! Now ime alone and still make it to put in freezer. This is a hit, although I used real hamburger in my “hamburger soup”! I add a few more flavorful veggies and it rocks…..I eat 2 big bowls myself!! YUM!! Looks delicious! I can’t wait for soup season! My family would LOVE this!! It looks incredibly delicious! 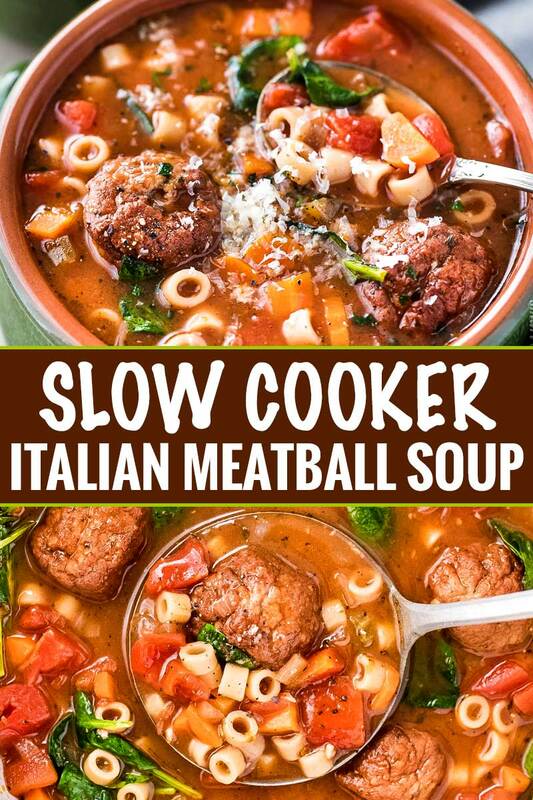 LOVE that this soup is made in the slow cooker! 🙂 It looks amazing. Ohhh I can’t WAIT to try this! Now, this recipe will be one of my favorites. Looks incredible! I like all the ingredients in it.